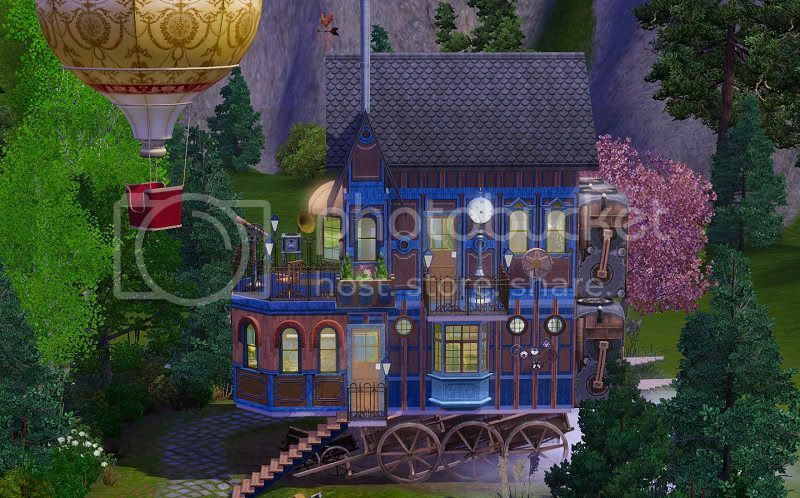 Mod The Sims - Steampunk Ahoy! You might notice small protrusions through the first floor of the house, they are from the chinese wagons underneath, they will not interfere with your Sims' walking routes/pathing/access to things. The fog emitters can be removed if you don't want the look of "steam" streaming down onto the ground from those mega engines mounted on the back of the house lol. 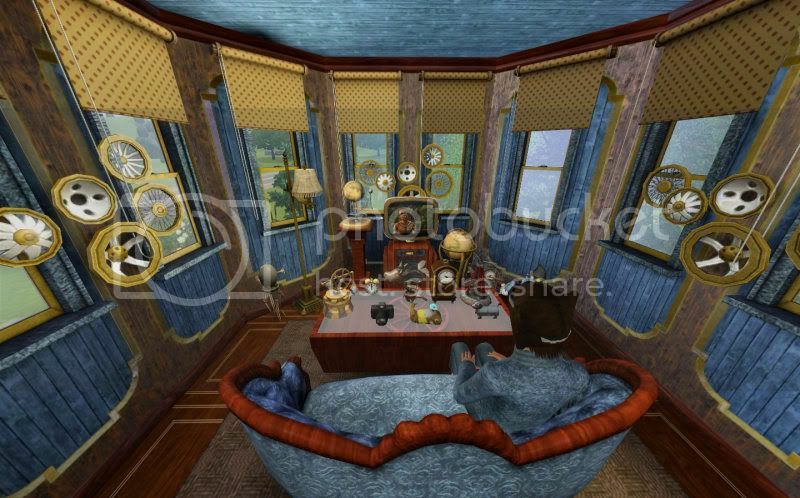 The house itself was based on the one in the picture below, but as usual I deviated from the original so that I could fit living space into it and used a colour scheme that looked "steampunkish". Why do you post this in this thread? Why not search the site for an answer to your problem, read the installation instructions here or go to the MTS help section help section and ask there? Thank you for helping me find those Chamades. I installed the 4 of them. They look so cool on your Steampunk house. I also installed the converted Hot air balloons. However, they look so drab compared to the one in your photo. 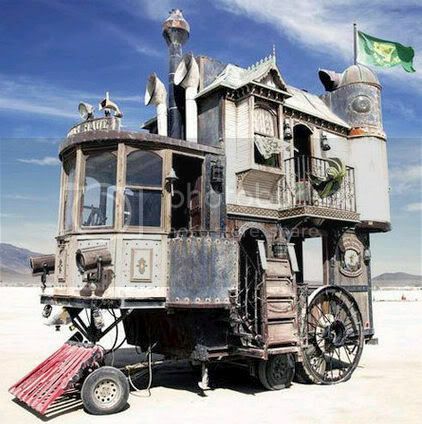 You know what this reminded me of as SOON as I saw it: HOWL'S MOVING CASTLE! That's the first thing I thought too. Although I'd love one like Howl's; all leggy and uneven and is moved by a fire demon called Calcifer. That doesn't mean I don't love this one, though! It's awesome! Holy wow, this is amazing, thank you!! 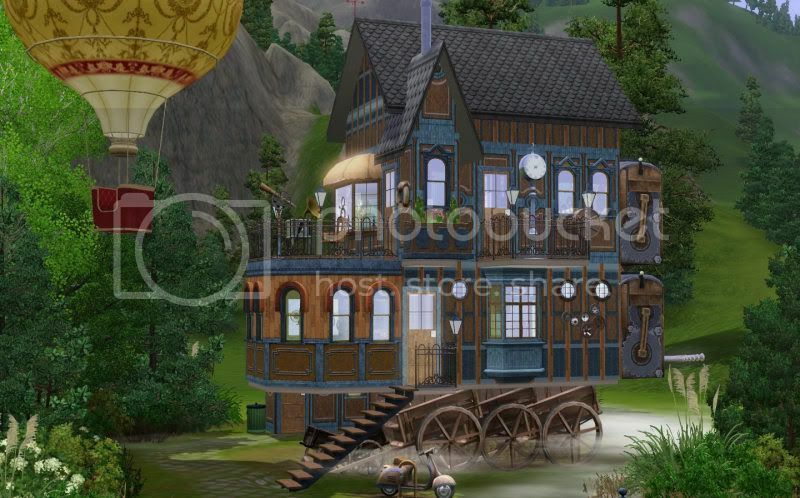 Matches with the steampunk stuff that I downloaded from the Sims base website. <3 ... no more words required! This is just ... wow. Words escape me. Love, love, love!! This is absolutely incredible. This must have been extremely tedious work. I LOVE steampunk. And I love this. So now, I love you. My jaw hit the floor. Thank you so much for this beautiful piece of work. Can't believe someone actually made the Neverwas Haul in the Sims. I've actually been inside this thing in real life and I'm a bit impressed. Good job, cheers. Absolutely stunning and very creating...if I could create anything half as good as this I'd be a happy woman! Inspired by Howl's Moving Castle, eh?! For those that don't know, the picture that this was based off of is a moving steam-powered house created by Major Catastrophe. Thank you tons! This looks amazing! Totally loving it!